This world chronicle in French, illuminated with 26 miniatures, presents the history of the world since its creation, leading to the mythical foundation of France and the Hundred Years' War, dealing with the time of Charlemagne, Saint Louis, the battle of Azincourt, the story of Joan of Arc (illuminated twice), Charles VII, followed by the Pragmatic sanction of Bourges. The book ends with the history of the popes until 1417. 155 x 110 mm. – 132 leaves, with 26 miniatures (each c. 70 x 70 mm), between two vertical block-borders with an historiated decor drawn in black ink on a gold ground. Medieval chronicles usually begin with the creation of the world and divide world history into six eras, the last of which begins with the birth of Christ. Continuous development could be suggested by drawing genealogical lines between emperors, kings and popes – which on large scroll manuscripts indeed often was done literally. To fill chronological and genealogical gaps between large periods, the present chronicle harks back to the Homeric and Virgilian history of Troy, in medieval times known as the matière de Troie. Thus, before the fall of Troy is described, a continuous line is suggested between Japheth to Aeneas, followed by the successive foundations established by Trojans in exile: Rome by Aeneas, with the first centuries of its history until Hannibal, the history of the Sicambri (Germanic people) led by Priam the Young, the foundation of Lutetia by his son Francus (another name for Astyanax, son of Hector), followed by the history of Gaul until the Roman conquest and the foundation of London by Brutus, great-grandson of Aeneas with the history of Great Britain. Late Antiquity and medieval Europe until the Hundred Years War are then presented, from the Roman emperors onwards, from Caesar to Constantine VI, followed by the transfer of power to Charlemagne and the Germanic emperors, and finally the dynasties who ruled France from the Merovingians to Charles VII. 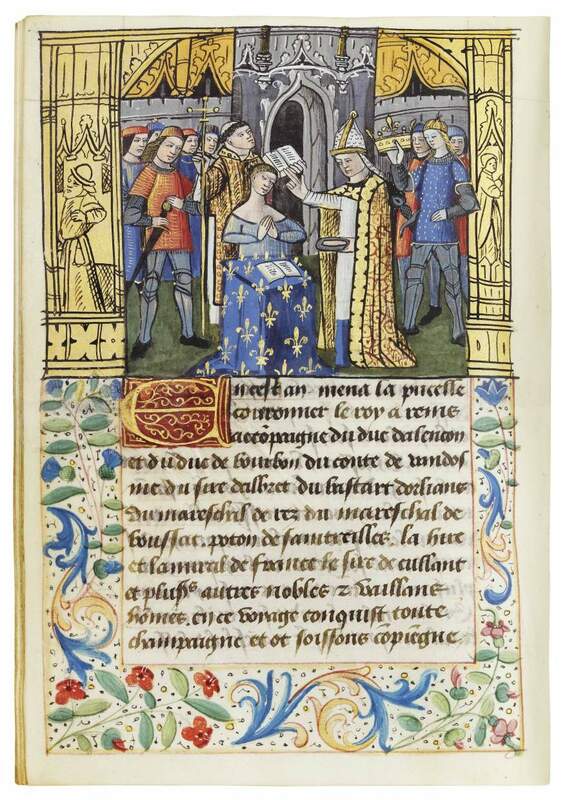 The last mentioned fact is Charles’s military expedition in Tartas in 1442, the last event illustrated is the Pragmatic Sanction of Bourges of 1438. The present manuscript ends with the history of the popes until Benedict XIII whose death is no longer recorded. The texts are illustrated with 26 (of an original of 27) miniatures painted in colours, between two vertical block-borders with a historiated decor drawn in black ink on a gold ground as in later woodcuts or engravings. The miniatures contain clear and vivid illustrations: the first 11 scenes are devoted to biblical history, Trojan and Roman history is illuminated by one image each, French history has 12 scenes, while papal history is highlighted with only one image. The half-page miniatures are quite appealing. The figures of men and animals are somewhat bold and stiff with sturdy feet. They are comparatively large in scale related to the settings. The protagonists wear clothes and armour of the time around 1480. The simplified buildings and townscapes offer no details for more precise localization or dating. Only one direct parallel manuscript has come to our attention that likely originating in the same workshop, possibly in Bourges. For more information on French world chronicles, please refer to our blog post on this subject.